Are you making all your testimonials work for you? As a business owner you will know that LinkedIn is a great B2B social media platform and an excellent place to showcase your experience. One key way to do this is by having recommendations. These are totally independent but unfortunately they do have their limits. You can only be given a recommendation by another LinkedIn member. For many of us this is absolutely fine but for some businesses this can be very limiting. It maybe the nature of your work is confidential or perhaps your clients are just simply not on LinkedIn. For example if your clients were predominantly aged 65 plus. So what can you do if this is the case for your business? This is a question I am commonly asked when training on LinkedIn. Well LinkedIn now allow you to attach files to you profile. This means that you can still ask for a recommendation and attach it to your relevant work experience section or even your main profile summary. Your clients can give a written testimonial, anonymously if necessary which you can scan in to your computer. Whilst in ‘edit mode’ on your profile, just click on the symbol highlighted below and follow the instructions for uploading a file. So why not look back in your files – have you got a fabulous client testimonial that is gathering dust? Scan it today and get it up on your LinkedIn profile! If you would like more tips on LinkedIn I am running my next workshop – LinkedIn for the Small Business Owner on 28th April 2016. For more information click here. I spend a lot of time crafting written communication that has maximum impact, whether that be copy for a website, a case study or perhaps social media posts. However last week I felt like a fish out of water when the communication became verbal not written, and even worse on video! I consider myself a confident speaker and can happily stand up and present a 40 second business introduction or deliver a training course. But speak into a camera – nope that is way out of my comfort zone. I was attending a Video Presenting Skills for Business course at Pinewood Studios with the aim of perfecting a 1 minute promotional video. It was a thoroughly enjoyable day and I wanted to share some of the key things that I learnt. The words you use – surprisingly not the most important part! When presenting you need to think about the most important words that you want to get across and make sure you emphasize them. Don’t be afraid of silence – leave a pause – this can be very powerful. Check your speed – even if you think you are speaking slowly the chances are you are not. Even though you are not talking to someone in person you will be on video and the person will be watching you very closely. Look into the camera and be authentic, use eye contact. Be passionate – it is your business so be proud! And finally remember SMILE and your voice will too! Get back to basics and communicate! Over the years it has been fascinating to see how communications have changed and how we use language to communicate. I can remember spending many hours getting very frustrated with mail merge, printing off letters by the hundred and stuffing envelopes ready for post office. Now using systems such as Mailchimp we can send out correspondence to hundreds of contacts at the click of a button. Even how we communicate with friends and family has changed. Once upon a time we would set aside time to write to a friend, probably having spent a lot of time at some point choosing just the right paper and envelopes. Now we send short text messages in ‘text’ speak, or quickly comment on or like a Facebook post. We even send birthday and Christmas cards electronically. 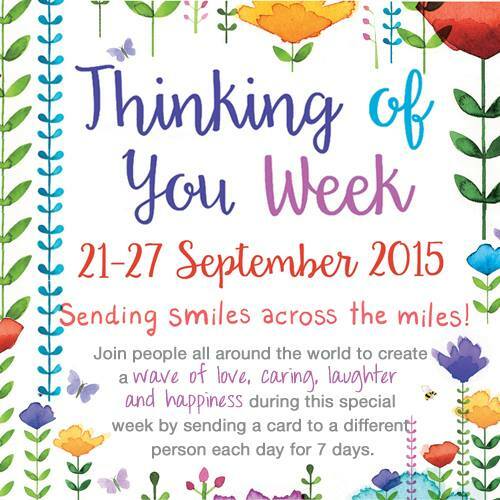 That is why I am pleased to see that week commencing 21-27th Sept is National Thinking of You Week. The objective is to encourage people to ‘think’ of people they haven’t been in contact with and reach out to them. Do you remember the last time you sent a handwritten card or letter? How do you feel when one arrives at home addressed to you? I bet you smile and feel just a little bit excited. This doesn’t just have to be about friends and family. Think about your business – are there people on your database you have not interacted with for ages? Why not use this special week to focus a handful of contacts and connect back with them. Not by bulk email. Be daring – pick up the phone and talk! You really might be surprised at the results. As a business owner you are no doubt working with limited resources and any budget that you spend on marketing activities needs to deliver results. I was attending a training course last week and it was really interesting listening to the other delegates talking about the challenges they face in developing their businesses. A pattern started to emerge and it was clear that although their product and service offerings were all very different that actually shared the same target customers. Some of their marketing activities were very similar too – they had websites, they used social media and they enjoyed networking. We are obviously all focused on our own businesses but sometimes we are too focused and can overlook opportunities that are ‘outside the box’ to do something a little different. These ladies had the ideal opportunity to collaborate on a marketing campaign – a dressmaker, a photographer and a confidence coach. For example the professional business women who, for whatever reason, needs some coaching, then has a new outfit made for herself and then has her new headshot taken. What a great story with lots of marketing opportunity! So what are some of key success factors when considering a collaboration? Have a clear objective for wanting to collaborate? Research and brainstorm best companies to work with. Be clear about what you have to offer the collaboration. So do you have any examples of a collaborative project you have worked on?